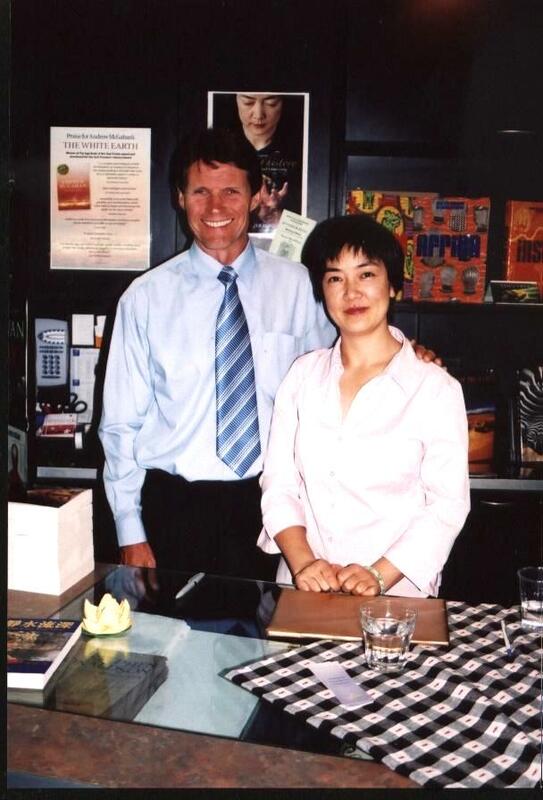 Jennifer and John Dowie, a local volunteer, at a book signing event in Sunshine Coast, Queensland, Australia, in 2005. This account of China''s ruthless suppression of Falun Gong should be compulsory reading, writes JAMES BRADLEY. For many in the West, Falun Gong is little more than a distant memory, a half-remembered image of the moment in January 2001 when five practitioners set themselves alight in Tiananmen Square in protest at the Chinese government''s suppression of the movement and the brief flurry of concern that followed it. Four-and-a-half years later, Falun Gong practitioners still picket Chinese embassies worldwide and yet the plight of their fellow believers has dropped off the world''s radar (if not off the radar of Chinese "diplomats"). The cynical might suggest that the amount of money to be made in China encourages our politicians and media to ignore the ruthless suppression of the movement by the country''s leaders, just as they did after the Tiananmen Square protests in 1989, along with the abuses of human rights of all sorts in the People''s Republic of China. Others of a less cynical bent might point to the way the events of September 11, 2001, and their aftermath, have crowded out consideration of a raft of issues worldwide, including the nature of Falun Gong itself, which remains poorly understood outside China; suspended somewhere between its adherents'' description of it as a philosophy and the PRC''s characterisation of it as an "evil cult". I was reminded of this last tension while reading Witnessing History, which is part-memoir and part-manifesto. Jennifer Zeng''s account of her imprisonment, re-education and eventual escape to Australia offers a glimpse not just of the true face of the Chinese government but of the threat holiness poses to the powerful. As an account of the PRC''s brutal suppression of Falun Gong, Witnessing History offers a useful counterbalance to the reckless enthusiasm of our leaders and media for the Chinese miracle. Its descriptions of conditions in the country''s labour camps and the arbitrary nature of the judicial and criminal justice systems should be mandatory reading for politicians and journalists alike, not least the fact that the goods produced in the camps are sold back into the Chinese economy at bargain prices, thereby reducing the cost to foreign business. Surely even the Murdoch press''s most enthusiastic exponents of free trade might be given pause by the idea Australians are wearing clothes made from cloth produced through forced labour? But Witnessing History is not just about bearing witness, it''s also a profession of faith, beginning with Zeng''s first encounter with the Zhuan Falun, Falun Gong''s foundational text - "I felt like a blind person given sight" - through the testing of that faith during re-education and her eventual escape. Zeng''s faith in the teachings of Falun Gong''s founder, Li Hongzhi, is all-consuming and all-pervasive (rather wonderfully she uses a translation of the Zhuan Falun to brush up on her English before departing for Australia) and while the constancy of her belief has been a source of strength through experiences intended to break her, it makes for less than satisfying reading. In and of themselves literary descriptions of faith and the strength it confers are always of more interest to the converted than the unconverted and Zeng''s is no exception. There is something slightly unnerving about the strength of her dedication to Li Hongzhi''s teachings, particularly as its costs to her and her family grow ever greater. But it is also in precisely this that Witnessing History speaks most clearly about the nature of life in the PRC. For the state that has the most to lose from its subjects'' freedom to choose is always the most threatened by their profession of what is, to them at least, the truth.